Whitebait Cottage is very close to the beach and whitebait creek which sometimes runs in front of the property, depending on the beach conditions. ON THE SAME PROPERTY AS ON THE BEACH -PENGUINS RETREAT. AND OCEANSIDE About 30 metres from the cottage we have made a stone path that leads to a private seating area specifically for the cottage guests- ideal place to watch the waves and the sunset. Located 3 kms North of Hokitika, the greenstone capital of New Zealand and the home of the Wildfoods Festival. Own garden area. Have a bonfire on the beach at sunset and watch the many different birds travelling to their nightly roosts. Surfcasting, stone fossicking . Let the sound of the waves send you to sleep. 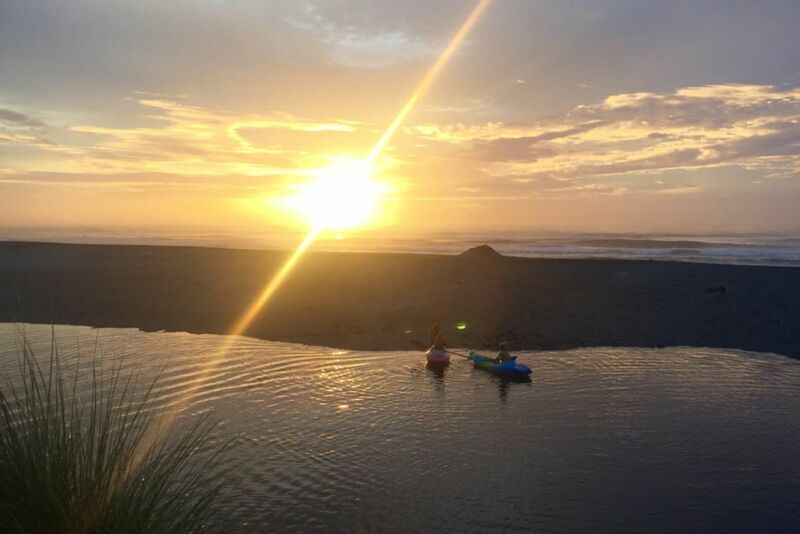 Hokitika is centrally located on the West Coast - 20 minutes to Lake Kaniere and Lake Mahinapua. Two hours to Franz Josef glacier. One and half hours to Punakaiki. 40 minutes to Shantytown.and Black Water rafting, to name just a few experiences you can have from here. We are happy for you to have a child in a cot or on a mattress on the floor. Bed is a split queen but we prefer not to split it. Brilliant ! Second time we have stayed here - Many thanks . Would certainly recommend this seaside batch to others. Whitebait Cottage is ideal for a couple or family, close friends too. It’s open-plan living and sleeping space is light and airy with nice bathroom and lovely shower. Unfortunately there’s nowhere to hang clothes but fine for a short stay. Linen was plentiful and fresh. Laundry is good although there’s no instructions on using the washing machine, but it isn’t difficult. We went to see the eels - I think that they were disappointed that we didn’t have any food for them. Lovely to hear the waves at night and to walk along the beach. Would stay here again. Owners very good to deal with. Close to quiet private beach. Magical ocean spot in comfy quarters! Beautifully located. And one for the nostalgia buffs. We loved our stay at Whitebait cottage. Reminiscent of an earlier time of relaxing by the beach in an old-style Bach, the cottage located right next to the beach was both charming and comfortable. We wished we could’ve stayed longer.